A perfect blend of modern design and traditional construction, with her solid teak decks she not only looks stunning but is fast, comfortable and a delight to sail. 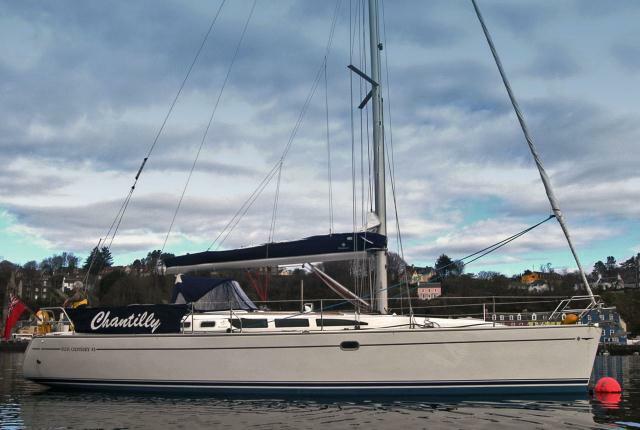 On deck she is uncluttered and the reefing system ensures easy handling of the mainsail whilst an easy to use roller reefing system attends to the genoa. She has a very spacious cockpit and her twin wheels provide the helmsman with an excellent choice of viewing positions. The flexible layout below provides accommodation for up to 8 people without using the saloon. 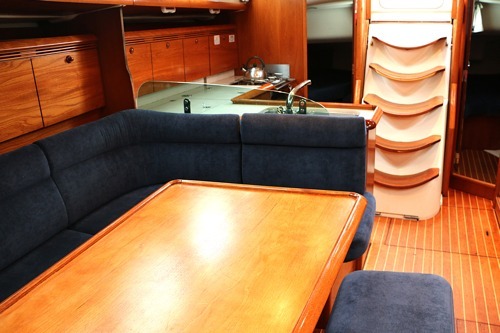 In addition, the saloon seating converts to make another double berth to starboard. 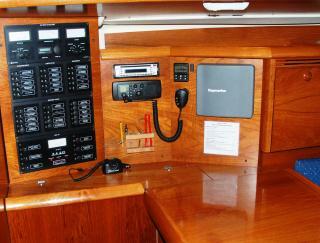 Other features are a well laid out and very practical galley, 2 heads and a full size shower. The shower room, along with the rest of the boat, is fitted with warm air central heating which also creates a great drying space and wet locker when the shower is not in use as a shower. Standard equipment includes a fully battened mainsail with lazy jacks and single line reefing, electric windlass, autopilot, GPS plotter, wind/speed/depth instruments with repeaters, 200 litre fridge, deluxe cooker with 2 burners, grill and oven. 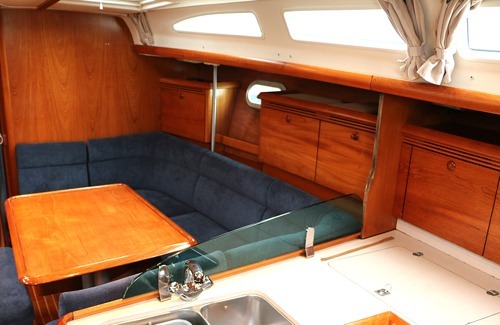 The entire saloon has recently been reupholstered in a luxurious fabric that makes this very comfortable boat even more cosseting after a hard days sail. She is the sister of ‘Eloise’ – a very similar boat but Chantilly is the classic layout whilst Eloise is the Deck Saloon version. 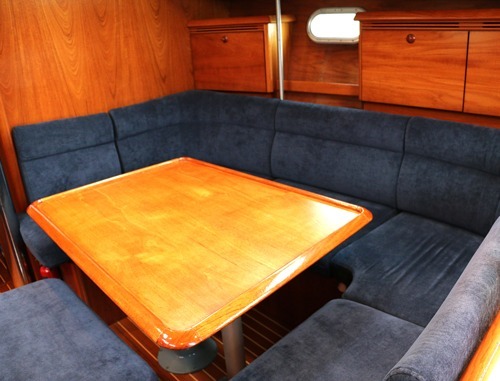 The yacht is fitted with a HD LED TV/DVD player in the saloon – so bring your DVD’s along!